Montreal-based real estate firm Canderel Group of Companies this month celebrated a British Columbia game changer, landing the mandate to act as property and leasing manager for Vancouver’s huge Bentall Centre. Canderel will take charge of the four-office, 1.4 million square foot office and retail complex in mid-July. Situated in the downtown core and connected to the Burrard SkyTrain station, the four Class A and AAA office towers are home to top tenants such as Bank of Montreal, Blakes, CIBC and Deloitte. While Canderel is very active in the province, the agreement marks the only current third-party property and leasing management for the company. “It is definitely an expansion in the B.C. property management part of Canderel,” said Bryce Margetts, the company’s vice-president of Western Canada based in Vancouver. The Vancouver-based Margetts, born and raised in the province, notes that Canderel has pretty deep roots in B.C. “We have been pretty active here the last eight years in acquisition of properties and development and trading. We have four real platforms of our business nationally, buying property, developing, we are partners in a real estate fund and property management is a big part of that. The addition of the Bentall Centre brings the company’s total management portfolio to approximately 23 million square feet. Much of Margetts’ focus is over the Rockies in Alberta where Canderel acquired property management firm Humford Management Inc. two years ago. “We added 50 people and about 8 million feet there and B.C. this (Bentall Centre assignment) is definitely a way to really plant a national footprint.” Humford, with offices in Edmonton and Calgary, currently manages a portfolio of more than 125 properties. The company would like to add further third-party property management contracts in the province but the B.C. executive wants to proceed methodically. Privately owned, the majority of Canderel’s owned property portfolio of about 10 million square feet is in its home market of Montreal, with a smaller office portfolio in Toronto. 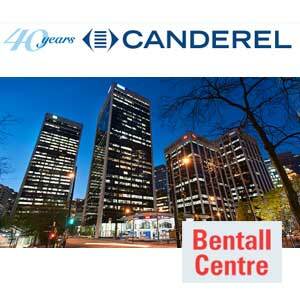 Founded in 1975 by Jonathan Wener, Canderel is active in real estate investment, development and management. Beyond its headquarters in Montreal, the company has regional offices in Ottawa, Toronto, Calgary, Edmonton and Vancouver.